Not only does 2018 mark the year we established SHIFT, it’s also when we christened the Creative Fund, our grant program for short narrative films. You can learn more about it here, but suffice to say, it’s just one way we support creators. We’re deeply invested in the success of our community, and we like to learn what makes the magic of the screen so enticing. That’s why we asked each of our Creative Fund recipients to draft a little something about their process. From pre-production to being on-set and wrapping it all up in post, we wanted in on the sausage-making — and thought you would too, you aspiring (and inspiring) filmmakers, screenwriters, directors, editors, and producers. 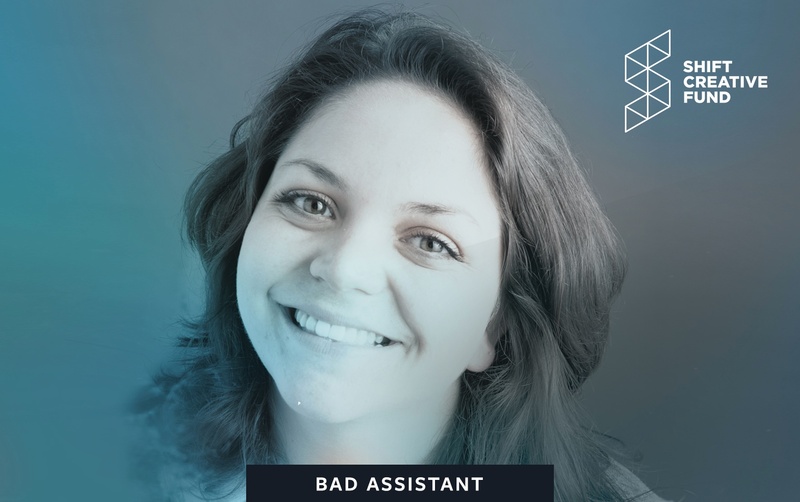 So meet Paige Klone, the creator, actress, and producer behind Bad Assistant, one of three short films awarded our first-ever SHIFT Creative Fund grants. Below she explains the inspiration behind the script, written by Rachel Forman, and the very real stakes that underpin the storyline because everyone in Hollywood has to start somewhere. Here, then, is Paige's story of beginnings and growing stronger. I moved to Los Angeles in 2011 with a dream: to become a personal assistant. Just kidding. I relocated to become a comedian and writer and, after only a few days, was lucky enough to land an internship at a development company owned by a comedian I looked up to. A few months later, I found out I was verrrry good at getting his coffee and became his personal assistant. Six years and three celebrities later, I’ve learned that being a personal assistant is really just being a stay-at-home mom to a 45-year-old man, which can be fulfilling but can also lead to an identity crisis. I’ve been blessed to work for some really great people, like actors David Koechner and Jason Schwartzman, who stars in Bad Assistant, but I’ve also had situations where I was in toxic environments and had to quit. No. It’s not. I have never moved a dead body in my life for anyone. Ever. That said, sometimes it felt like I moved a dead body. After becoming a personal assistant, I carried this notion of writing a short film about the complicated relationship between a personal assistant and his or her boss — that feeling of “I can’t disagree. I have to say yes to every task. I have to be pleasant and easy to deal with.” Values can get easily compromised when you think that way. As a personal assistant, you’re essentially an extra limb for your boss. You represent him or her wherever you go; you often speak for them — you have to, in a sense, become them. So being defiant is not an option. You just have to go with the flow and do your best in the process. Bad Assistant isn’t based on anyone I worked for. It’s more of an accumulation of my story and friends’ stories of what it’s like to work at the bottom of the barrel in Hollywood. It's really important for me to share this perspective because the people who hold these types of jobs — personal assistants, nannies, PAs on set — don’t normally have a voice that’s heard or valued. Whether they’ve signed an NDA or simply internalized the culture of hush-hush bad behavior, they’re the silent enablers. When the #MeToo movement came out, I realized that, yes, there is sexual harassment in this industry, but there’s also a more general abuse of power — verbal, emotional, and sometimes physical — suffered by women and men who hold entry-level jobs in Hollywood. I’ve been bothered by it since moving to Los Angeles — not just that this manipulation exists, but that it’s so commonplace that everyone accepts it as normal. You can get sucked into a job for three years where you’re being emotionally abused and you tell yourself that’s just how Hollywood is . . . because that is how Hollywood is. Working a job that’s considered the bottom of the barrel always comes with consequences. To work your way up to having a voice, you don’t just need talent; you also need strength.